The memorial includes two gray granite pillars flanking a shorter black granite slab with incised inscriptions. The left pillar lists the wars and military operations in which local veterans served beginning with World War One. The monument’s right pillar holds bronze seals representing the five branches of military service. Both pillars feature an incised American Eagle clutching arrows in its talons. The gray pillars are topped with small blocks of black granite pieces and the total height is seven feet including the double base. The lower large base piece is gray granite with rusticated edges. The upper base is black granite smooth finished on all sides. 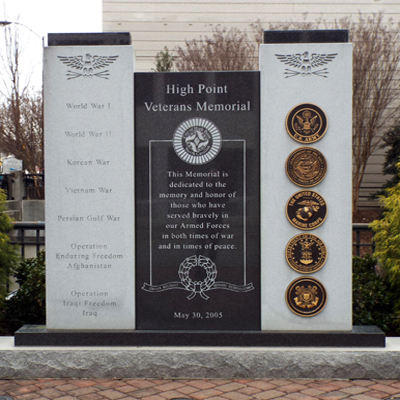 In addition to the inscription the center slab features the City of High Point logo. A stone plaque listing sponsors and donors is laid into the brick patio in front of the memorial. High school student and history buff Nicholas Ruden led efforts to raise money for the Veterans Memorial. He was also responsible for seeing the World War One “Doughboy” statue cleaned, repaired and moved to this same location in 2004. The memorial stands on a brick plaza, or, Memorial Park, located at the intersection of N. Main Street and E. High Avenue. Other memorials include Revolutionary War Patriots, African American Gold Star plaque, World War Two Honor Roll, WWI Doughboy statue, and POW/MIA plaque. On the corner across E. High Street is a plaque to General Maxwell Reid Thurman. Across Main Street at the restored High Point Train depot is the Plank Road Foreman statue and “High Point” marker. 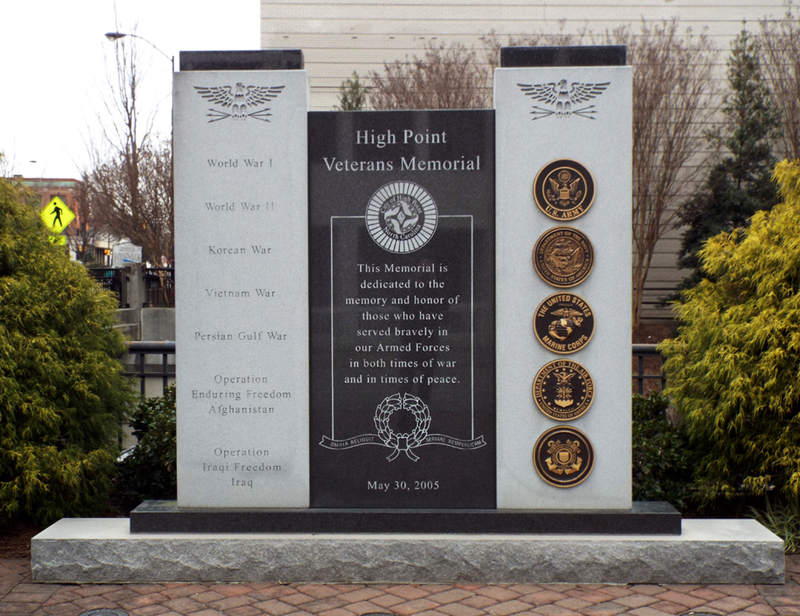 Bushes and trees adorn the brick plaza where the High Point Veterans Memorial stands on.